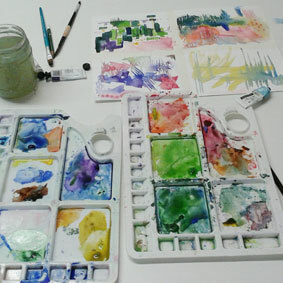 These weekly watercolour classes are relaxed and informal, but very informative. 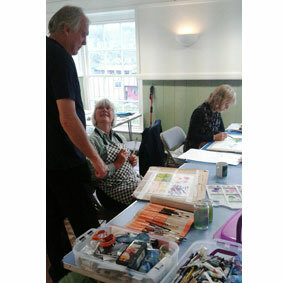 The classes are open to all abilities, from complete beginners who want to learn the basics of watercolour, to the more experienced painter looking for inspiration. Rob and Siân are experienced, fully qualified teachers. While Rob’s preferred subject matter is landscape based, and Siân’s enjoys painting florals, portraits and still life, their teaching ethos is to teach techniques, enabling students to apply the skills learned to paint their own choice of subject matter. They enjoy sharing their extensive knowledge of watercolour with their students, and are genuinely thrilled when students exceed their own expectations. If you are not sure whether this is the right watercolour class for you why not come along for a single session before deciding whether to commit to the remainder of the term. under the helpful guidance of the tutors. Cost: Students joining part way though a term pay initially for one trial class (£12), then for the remainder of that term at £10 per session. Students bring their own materials. 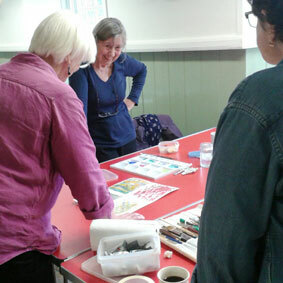 Both Rob and Siân have growing reputations nationally and internationally as art tutors. They are both regular contributors to The Artists and Illustrators Magazine, and for the last four years have demonstrated for the magazine at the prestigious Art in Action. Some of their step-by-step tutorials can be found on the magazine’s website. Both are very popular tutors for ArtTutor.com, a web based tutorial site with a large international following.